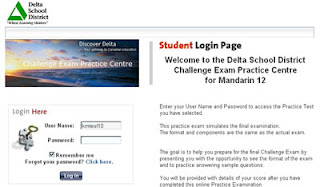 Today we launched the Delta School District Challenge Exam Practice Centre for Mandarin 12. Using our background in testing platforms (TOEFL, TOEIC, UK accounting exams, nursing, legal), we added a sophisticated testing engine to the ACTDEN E-learning platform. The Mandarin 12 exam has two versions and supports both Simplified and Traditional Chinese exams. The practice exam is a full simulation with reading, listening, speaking, and writing sections. The test costs C$25 and enables students to take a practice Mandarin 12 test online. This is a helpful and convenient service for students across the province preparing to take this exam. Interested students can order a practice exam here through our partner ILC Interactive Communications. In British Columbia, students with Mandarin as their mother tongue can choose to skip the course, take the Challenge Exam to obtain provincial credit for the course, and meet their second language requirement. By the end of 2009, we expect to have Challenge Practice exams for other languages and subjects available from the ACTDEN E-learning platform as well.